Describe the horse’s attitude – bright and alert, depressed, lethargic, quiet, anxious, uncomfortable, etc. Describe horse’s actions – not moving, not bearing weight in a leg, pawing, looking at the belly, pacing, shaking, uncoordinated, etc. Take horse’s temperature – normal temperature is 98 to 101 degrees F. Normal temperature for foals is 99 to 102 degrees F. Temperature can vary depending on the outside temperature and if your horse has been exercising. 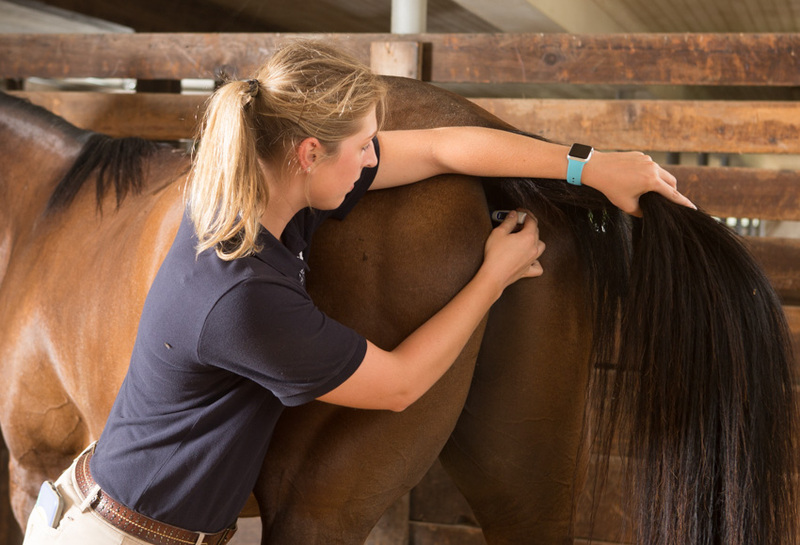 Click here to watch a video of Dr. Lewis demonstrating how to take a horse’s temperature. Determine horse’s heart rate – normal is 28 to 45 bpm (beats per minute). Normal foal heart rate is between 60-100 bpm. Heart rate can change depending on exercise, pain and anxiety. Determine horse’s respiratory rate – normal is 8 to 20 bpm (breaths per minute). Normal foal respiratory rate is 30 to 40 bpm. Look at nostrils or flank area to count each breath. Assess horse’s appetite and water consumption – eating/not eating, eating grain but not hay, drinking water/not drinking, etc. Assess horse’s urine output – amount (wet spots in stall) and color (yellow, red, brown). Listen for gut motility – be able to tell when there are no guts sounds (1-2 gurgles per 30 – 60 seconds), excessive gut sounds (loud, nearly constant gut sounds). Look at mucous membranes – know their normal color (pink) and texture (moist). Be able to describe abnormal mucous membranes (white, gray, dark pink, purple, dry/tacky). Click here to watch a video of Dr. Lewis demonstrating how to check a horse’s mucous membranes. Assess for heat or swelling in legs and hooves. Assess lameness – bearing weight, but lame at a walk, toe touching when walking; walking sound, but lame at a trot; non-weight bearing (not putting the leg down at all). Note nasal discharge – from one or both nostrils; color, thickness, odor, blood, food in nasal discharge, etc. Note ocular (eye) discharge – if keeping eye open or closed, tearing or not, discharge color and type (watery, mucous), sensitivity to light, etc. Vaccines – know what vaccines your horse gets and when. Know if you horse is up to date on the tetanus vaccine. The tetanus vaccine is needed once a year.